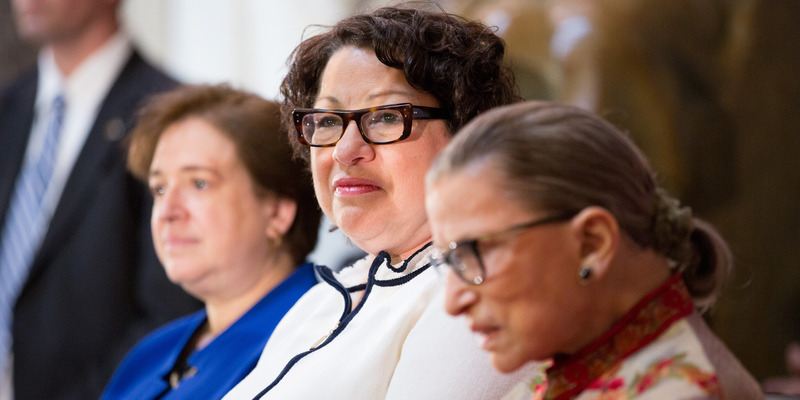 Allison Shelley/Getty Images(L-R) U.S. Supreme Court justices Elena Kagan, Sonia Sotomayor and Ruth Bader Ginsburg. Supreme Court justices Sonia Sotomayor and Elena Kagan gave remarks about their experiences on the nation’s highest court, and talked specifically about the idea of political bias on the bench. Sotomayor spoke broadly about how Supreme Court justices need to always rise above the political fray for the sake of the court’s integrity, and said that the effort begins with how justices interact with each other. “We have to treat each other with respect and dignity, and with a sense of amicability that the rest of the world doesn’t often share,” she said. That conversation is happening in the backdrop of what has been a tumultuous vetting process for their newest colleague, Brett Kavanaugh, who the Senate confirmed to the Supreme Court on Saturday after weeks of sexual-misconduct allegations that culminated in a public outburst during which Kavanaugh attacked Democrats. “There are structures within the court – not the least of which is our modern understanding among what are now eight justices – that we have to rise above partisanship in our personal relationships,” Justice Sotomayor said at Princeton University on Friday. Sotomayor spoke broadly about how Supreme Court justices need to always rise above the political fray for the sake of the court’s integrity, and said that effort begins with how justices treat each other. “We have to treat each other with respect and dignity, and with a sense of amicability that the rest of the world doesn’t often share,” Sotomayor said. That conversation is happening in the backdrop of what has been a tumultuous vetting process for their newest colleague, Brett Kavanaugh, who the Senate confirmed to the Supreme Court on Saturday. Kavanaugh’s confirmation comes after weeks of sexual-misconduct allegations that culminated in a hearing in front of the Senate Judiciary Committee on September 27. During that hearing, Kavanaugh publicly denied a claim from Christine Blasey Ford, a California professor who said Kavanaugh sexually assaulted her. He also launched into an attack on Democrats. Kavanaugh sought to walk back some of that emotion in a Wall Street Journal opinion column he published on Thursday.